There are many questions surrounding the fate of the North American Free Trade Agreement (NAFTA). To wit: will the treaty be renegotiated to meet the goals set out by the Mexican, Canadian, and U.S. governments? What provisions will be included in NAFTA 2.0? If the agreement is renegotiated, will it satiate public opinion in these countries? Will Prime Minister Justin Trudeau’s personal, quiet diplomacy ultimately appease President Donald Trump? Or will the whole thing collapse? Answers to these questions will have to wait, but as an historian with a passing interest in Canadian-American relations and Canada’s political history, a more interesting question is: where are NAFTA’s opponents? And where are the anti-American nationalists? In the United States, certainly, there are plenty of people who oppose the agreement: the very nativists, protectionists, and anti-Globalists to whom Trump’s promise to renegotiate or “terminate” NAFTA is aimed. NAFTA is a target, too, of Americans on the left, who worry about a variety of issues including labour standards, environmental issues, and the loss of jobs. Yet in Canada, all three mainstream political parties currently support NAFTA and there seems to be little in the way of grassroots movements meant to change their standpoints. Although there are differences among the parties on what new provisions should be included in any revamped deal, neither the ruling Liberals, nor the Conservatives of the Official Opposition, nor the New Democratic Party have advocated scrapping the agreement outright. Indeed, the NDP’s support for NAFTA – admittedly premised on a reformed deal being able “to protect Canadian sovereignty, especially in investment and energy security” – is surprising given that it seems to be a step backwards from the party’s outlook of the 1970s and 1980s, when it was more blatantly opposed to free trade with the United States. Moreover, given that much of the party’s platform clashes with NAFTA provisions, one wonders why the NDP has not chosen this moment to simply come out and oppose it. As for the Conservatives, they have largely backed the Liberal government’s position, to the point that former Tory ministers are serving on a panel advising the government on the negotiations (as is the NDP’s Brian Topp). Further, Conservative party officials have stated their willingness to keep criticism of the government on the file to a murmur at least while negotiations are ongoing. It helps, no doubt, that a large majority of Canadians back NAFTA. The cross-partisanship on display in Ottawa is all the more astounding given that free trade with the United States has been such a divisive topic in Canada’s past, one linked to anti-American political rhetoric that has often played well with Canadian voters. It seems counterintuitive that Trump, a president so reviled by Canadians, is not at front and centre of any concerted campaign to woo voters on a nationalist plank. Free trade itself was a leading and perhaps even decisive issue in three Canadian federal elections: 1891, 1911, and 1988. Concerns over economic ties with the Americans also influenced voters in 1972, with NDP successes in that vote prompting the minority Trudeau to adopt economic nationalist policies; in John Diefenbaker’s election wins in 1957 and 1958; and in the Progressive Conservatives’ collapse in 1993. The fact that Diefenbaker’s Tories could win on a vaguely anti-US platform and that Brian Mulroney and Kim Campbell’s Tories would be seen as too close to the Americans serves as a reminder that the major parties have altered their positions on the issue. 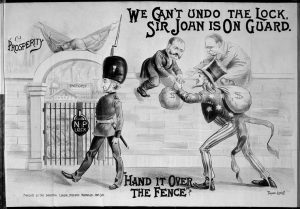 In 1891 and 1911 it was the Conservatives who were opposed to free trade – reciprocity – with the United States. “No truck or trade with the Yankees” was the successful Tory rallying cry in 1911 against a trade agreement made by the governing Liberals and already passed in the U.S. Congress. Twenty years earlier, Sir John A. Macdonald had opposed the Liberal Party’s reciprocity platform and defended his protectionist National Policy. In 1988, the two parties’ positions were reversed, with the NDP also opposed to the Canada-United States Free Trade Agreement, NAFTA’s precursor. These three elections are notable for the ways in which proponents of free trade were accused of treasonous actions, though such charges are more telling of the pull of anti-US sentiment in Canada. “You cannot get anything by kissing the feet of the people of the United States,” Macdonald told voters in 1878, the year he won re-election on the promise of introducing the National Policy. One hundred forty years later, we find none of the major political parties in Canada advocating such a stance, even as the current occupant of the White House is an easy, obvious, and, above all, deserving target of anti-American jingoism. So why the apparent consensus on NAFTA? Is the reason, perhaps, that no Canadian politician wants to be in bed (figuratively, literally) with Donald Trump? Has loathing for Trump and an aversion to being aligned with him on the issue of free trade caused cross-party support for NAFTA? Or have Canada’s three main political parties become such strong free traders that they are willing to avoid partisan sniping? Or are Canadians in fact far less anti-American than we seem? For all the partisanship of the free trade elections in Canada’s past it is worth keeping in mind that there have been moments of political cooperation on this file. The US decision to cancel the Reciprocity Treaty of 1854 was, after all, a step that alarmed many colonial subjects in British North America and became a cause of Confederation. And before turning to the National Policy, in 1871 John A. Macdonald had sought a renewed reciprocity agreement as a means of kick-starting the new country’s ailing economy. Though unsuccessful, he likely would have had the support of the Liberal Party of such classical liberals as George Brown and Alexander Mackenzie (who sought their own abortive free trade deal with Washington in 1874). Six decades later, in the midst of the Great Depression, R.B. Bennett concluded an agreement with F.D. Roosevelt that liberalized trade in certain sectors but fell short of his boast that he would “blast” Canada’s way into world markets. Unfortunately for Bennett, he was turfed from office before the deal could be signed. That duty fell to William Lyon Mackenzie King, who did so and faced little criticism from Canadians for whom the results of protectionism were then on full display. A further and far more expansive free trade deal with the United States was in the works just after the Second World War ended, but King, ever cautious about public opinion, nixed it as likely to be unpopular. Taking these examples into account, are we to deduce that cross-party support for free trade with the Americans is only present in periods of economic upheaval? Are we in such a period now? Have our close economic ties with the Americans, especially the reliance on the US market, produced a consensus that NAFTA should be defended, albeit tweaked? Relatedly, if perversely, is Trump right and NAFTA is the “worst trade deal ever made” in that it has only benefitted Canada and Mexico? Likely, the three parties are all backing NAFTA at this point because the deal’s end would spell considerable economic upset. But if one of the parties – or a sizeable chunk of Canadians – might perceive a renegotiated agreement as a bad deal, then the comity might end and we could hear cries of “No trade or truck with Trump.” After all, an American target is an obvious one for Canadian politicians, and the current occupant of the White House is an easy target indeed. And with the possibility that a deal may not get done, or that it may face defeat from domestic opposition in any of the three countries, it is worth remembering that for most of Canada’s history the country survived without a Canada-US free trade agreement. Asa McKercher is an assistant professor of history at the Royal Military College of Canada. He is the author of Camelot and Canada: Canadian-American Relations in the Kenney Era (New York: Oxford University Press, 2016) and co-editor, with Galen Roger Perras, of Mike’s World: Lester B. Pearson and Canadian External Affairs (Vancouver: UBC Press, 2017). Quoted in P.B. Waite, Canada 1874-1896: Arduous Destiny (Toronto: McClelland & Stewart, 1971), 91. Significantly, “free trade” has never been democratically approved by a majority of Canadians. In the 1988 federal election, the “free trade” parties actually lost the popular vote-a majority of Canadians voted against “free trade”. In 1993, the Chretien Liberals were elected in part on a promise to review NAFTA-and they eventually broke that promise by signing it in 1996. The problem with “free trade” as practiced under NAFTA (besides the hollowing out of our economy) is its undemocratic nature with the investor-state dispute resolution system, or the proportionality clause to which we’ve surrendered a significant amount of control over our resources. It allows unelected, unaccountable trade bureaucrats to dictate to elected officials, without any real constitutional mandate, much less checks on their power. …and again, that a majority of Canadians have never democratically approved.